On Friday night I took out a group on a medium night run, covering a few fun tracks, nothing too extreme. With rain that we had prior to trips going out throughout the day, was going to make them all a lot of fun! We headed out west of Moonambel into St Arnaud Pyrenees State Forest. Our first track was – Williams Trk, then it was off into the mountains up Billy Goats Bluff Trk, this is where the thick fog really made it hard for us to see, even with our low beams on! Some of the tracks we covered that night were- Dridan Trk, Cameron Trk, Cross Trk, Jackson Trk, Farnsworth Trk. Better still all the tracks looked a lot different in the dark. I had driven all these tracks only a couple of hours prior, what a difference the tracks can change so much, more mud, sight in front of you, things not working the way you want, brakes, etc. So after 2 hours we made it home, I’m hoping everyone enjoyed this night run, I did! I decided that we would do the night run I did the night before in reverse, plus extra! Saturday morning we headed out the East side of camp, down Glenlofty-Warrenmang Rd, into the Pyrenees Range State Forest. We stopped to make sure the whole group had aired down and was ready for a fun day out four wheel driving! On Jackson Trk, we had a bit of fun on in one section, which tried out all the vehicles, with only one vehicle taking the chicken track! This section gave everyone a chance to see how they drove under pressure, tyre placement, and right foot at the exact time! Some of the tracks we covered that morning were- Farnsworth Trk, Jackson Trk, Cross Trk, Cameron Trk. We stopped for lunch at Cameron hut, for some lunch and a toilet stop for people to use. After lunch we headed off down Cameron Trk. We stopped at the base of Old Kingtree Trk, we watched some motorbike riders try to tackle Old Kingtree Trk, but they couldn’t make it all the way up, so they all took the chicken track instead. The offer was put out for anyone that wanted to try it, but we had no takers! After a short drive on the gravel we headed off into Landsborough NCR, via Mountain Trk. The views are amazing in this area. We found a lot of tracks had been locked off by the landowners of the area. After travelling for about an extra 20 minutes we headed home. We headed backing into camp via the Stawell Avoca Rd. It was a good fun day by all, I enjoyed it! Well on the Sunday I took a trip out exploring. We headed out west of camp. The first track we took was blocked off by a vineyard. We headed into the St Arnaud Pyrenees State Forest, via Main Break Trk. Then off we went to tackle a few bush tracks, we went down Old Kingtree Trk, no only wanted to go up it, so it was decided we would continue along. We came a cross another group out from the muster. Stopping / pulling over to let them past. Notes were exchanged between leaders. So we continued on. 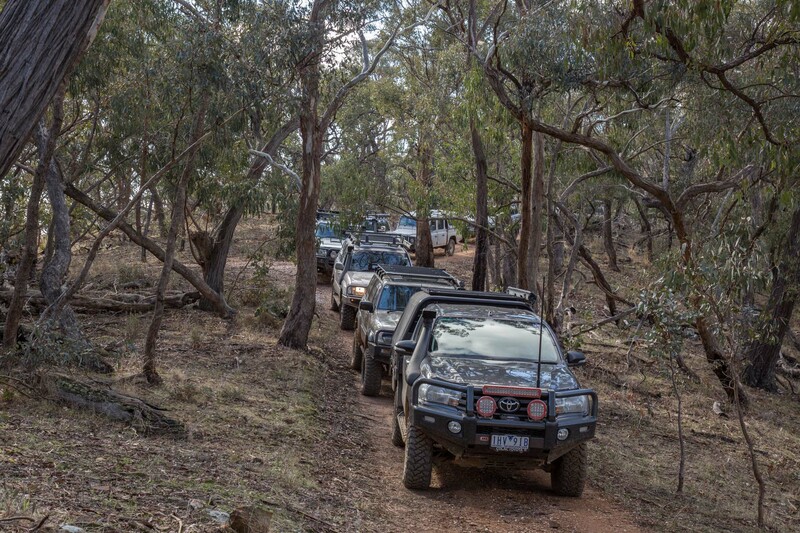 With info that the next track we were to tackle was most likely to slow us down with the selection of vehicle we had on this trip, it was decided to take it very slow and steady up Old Mill Trk, all vehicles and people made it up, no damage. Apart from some people getting their breath back! We stopped on Emery Trk for lunch. After a lovely lunch, we headed off to Old Tiger Cat Trk, Remembering it was from the east end we were heading. This track tests your judgement on how wide your vehicle is with trees getting very close to some mirrors, mine especially! After some directions from myself to the group I decided to continue down into the gully to the creek. How wrong I was, with in a kilometre of track I was at the bottom in a vehicle that was driveable but not as straight as it was only 5 minutes earlier. I gave the direction for the rest of the group to find a safe spot to turn around and head back out, which they did.. I was left on my own to work out a way out. But still in 2 way communication. After travelling through the creek a few times I made my way out along Cross Trk. We meet back at the intersection of Jackson and Main Break Trk, I was very happy to meet up with the rest of the group back at Jackson Trk. Then we made our way home from there. A full day of fun! What’s better than going out bush for a Sunday drive!